Take a walk out in the countryside (it’s healthy, and you need a little time to relax! ), and look at a meadow full of wildflowers. Very nice, isn’t it? But you know that most of the action in a meadow – most of the real work that keeps those flowers blooming and looking so good – is where you can’t see it: underground, too small too see, buzzing around in the air, or otherwise hidden from view. And you also know that much of the really important work that keeps your business operating goes on where the customer can’t see it: in the stockroom, in the accounting office, in meetings, and in the decisions that you and your management staff make. A customer calls your store to order a part with delivery ASAP. It’s important to the customer; getting the part on time may mean the difference between keeping or losing one of their major clients. But your store doesn’t have it in stock, and your store manager tells the customer that there are no drivers available to make a special pickup at the warehouse, or to deliver it to the customer’s site. You don’t know about any of this, because your store manager doesn’t mention it, and the customer doesn’t say anything to you – he or she just looks for another supplier, because after all, your store can’t be counted on to have inventory in stock – or to lift a finger to help out customers in a tight situation. All of that loss – loss of a customer, loss of future sales, loss of goodwill – happens where you can’t see it, and where you can’t do anything about it. Unless, that is, you know how and where to look. That’s where surveys that measure customer satisfaction, such as those conducted by Compechek, come in. Compechek’s trained survey-takers know what to ask, they know how to listen, and they know how to catch the signs of customer dissatisfaction. 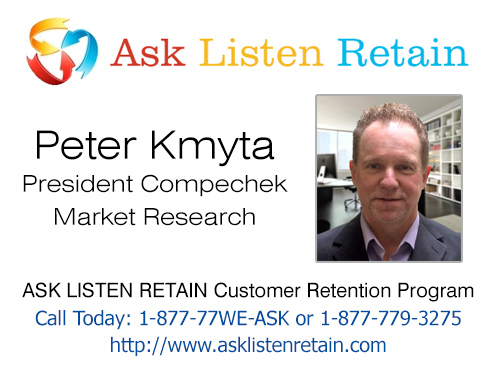 And Compechek’s ASK-LISTEN-RETAIN system for analyzing customer satisfaction feedback will alert everybody in the chain of responsibility, from the store manager up to top-level management, about unhappy, dissatisfied customers who might otherwise have gone undetected. This allows you to get ahead of the game when it comes to customer relation management, rather than falling behind and not even knowing why. Customer Hot Buttons - Why You Need to Know Them!